One of my favorite new tools is my We R Memory Keepers Photo Sleeve Fuse. 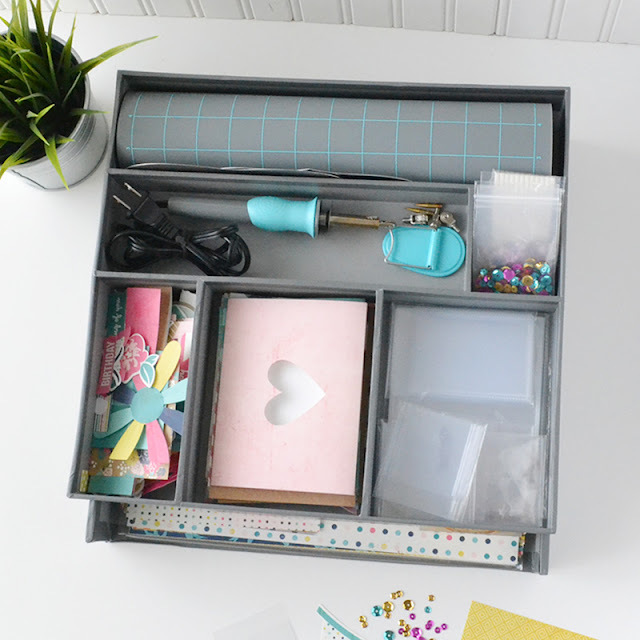 I love using it with pocket pages, waterfall sleeves, and plastic sheets to make clear shaker pockets, custom photo and journaling card pockets, and pockets for odd size memorabilia. I also love using the new FUSEables plastic papers and embellishments--so fun! But with all these fabulous products and accessories for the Fuse, I've been struggling to keep things organized. Enter my generous friends over at We R Memory Keepers. I just got a box full of free goodies, including a set of Fuse Storage Trays--problem solved! 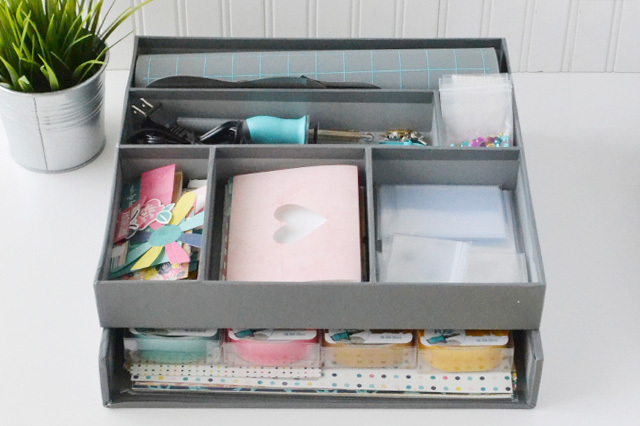 Check out how these cute and practical trays help me keep all of my Fuse goodies organized and easy to use. The Fuse Storage Trays come in a set of two--one larger one that fits 12x12 photo sleeves and FUSEables papers, and a smaller one that fits perfectly on top of the larger one and has compartments for holding the Fuse tool, the interchangeable tips, the stand, the mat, some waterfall sleeves, card kits, embellishments, and sequins. Let's start with the bottom tray. This is where I keep my 12x12 FUSEables plastic sheets and some 12x12 photo sleeves. I also store my 12x12 and 6x6 FUSEables plastic paper, along with the decorative tape. It's a pretty deep tray so I can fit plenty of supplies in there even with the top tray resting on it. Now, on to the top tray! This is where I store most of my items. This tray holds my Fuse tool , stand, and interchangeable tips. I keep both of my metal rulers along with my rolled up heat resistant Fuse Mat in the longest section. In the smallest section I like to keep my shaker pieces--sequins, confetti, etc. There's room in the front of the tray for all of my waterfall sleeves , from 4x6 size all the way down to 2x2 size. Next to those are the card bases from the FUSEables card kits , along with the embellishments next to those. I mix those embellishments with the ones from the FUSEables ephemera pack. Keeping all the embellishments together makes it easy to choose what I want when I'm creating a project. I'm so happy with these Fuse Storage Trays! I love how well my Fuse goodies stay organized and stored this way. None of my efforts at storing or organizing them before worked very well. This is a match made in crafty heaven!